Willowgrove Hall is a place full of beauty, wonder, and secrets. Soon, these secrets will be exposed and could change everything. Cecily Faire has a difficult past that she intends to keep a secret. Darbury, England, 1819, Cecily embarks on a new chapter of her life as a Lady's Companion, at the esteemed Willowgrove Hall. Both nerves and excitement overcome Cecily as she sets out on this new journey. What will her future behold? Then, without any warning, she is confronted by the one person who knows the truth about her past. Nathaniel Stanton is kind, handsome man, who happens to be the steward of Willowgrove Hall. Nathaniel's life is dedicated to serving those around him, yet he keeps his real identity and dreams to himself. Nathaniel has a secret of his own, he is the illegitimate son of Willow Grove's former master. As Cecily and Nathaniel get to know one another, they are drawn to each other. Yet, their secrets could be the one thing that changes the course of their lives in a way that they had not imagined. I love what it says on the back cover of the book, "Her secret cloaks her in isolation and loneliness. His secret traps him in a life that is not his own." I have heard wonderful things about the author Sarah E. Ladd, and I can't believe that up until now I haven't had my hands on one of her books. Ladd's Regency writing is authentic, engaging, and leaves you wanting more. Sarah E. Ladd is a best-selling Historical author. I had actually added A Lady at Willowgrove Hall to my "to read" list on Goodreads a while ago, so when the opportunity came up to review this book, I couldn't have been more excited. A Lady at Willowgrove Hall is an excellent novel that has love, a little bit of mystery, and adventure, as well as moments of finding one's self. Like I have mentioned before, it is not often that I pick up a book, begin to read it, and literally have a hard time putting it down until it is finished. A Lady at Willowgrove Hall is just that kind of book. I became so invested in Ladd's endearing characters, that I couldn't wait to find out what was going to happen next, yet at the same time I didn't want the book to end. A Lady at Willowgrove Hall is book three of the Whispers on the Moors book series. I have not read books one, or two in this series, so I can definitely say that A Lady at Willowgrove Hall can be a standalone book. 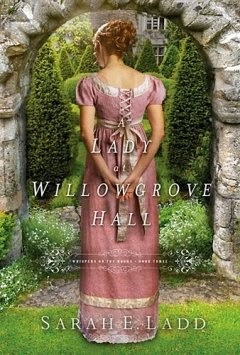 You can read A Lady at Willowgrove Hall without reading the other two books in the series first. However, once you read this book, you will want to start reading another one of Sarah E. Ladd's books as soon as possible. To purchase your own copy of A Lady at Willowgrove Hall by Sarah E. Ladd you can CLICK HERE to be taken to Amazon or CLICKHERE to shop at Barnes and Noble. "Sarah E. Ladd received the 2011 Genesis Award in historical romance for The Heiress of Winterwood. She is a graduate of Ball State University and has more than ten years of marketing experience. Sarah lives in Indiana with her amazing husband, sweet daughter, and spunky Golden Retriever." Want to find out more about Sarah E. Ladd's books? You can CLICK HERE to go to her Twitter page, CLICK HERE to see her on Facebook, CLICKHERE to see her on Pinterest, and CLICK HERE to go to her website. Disclosure of Material Connection: I received this book free from the publisher through the BookLook Bloggers book review bloggers program (http://booklookbloggers.com). I was not required to write a positive review. The opinions I have expressed are my own. I am disclosing this in accordance with the Federal Trade Commission's 16 CFR, Part 255. This "A Lady of Willowgrove Hall by Sarah E. Ladd Book Review" first appeared on my blog, Artistically Shauna, on March 31, 2015.